The Snooze Button Generation 2019: The Black Max: Evil or genius? It's rare that a product hits the market that revolutionizes lives. I say the television, cell phone and snooze button on alarm clocks did that. But a more subtle, but just as important, product was the Black Max tennis racket from Dunlop. Not long before the Black Max hit the market in 1980, tennis rackets were made of wood, then aluminum. The Black Max, AKA the Dunlop Max 200G, was the first widespread used graphite racket, and it totally changed the game. The Black Max was lighter. It offered more control, and it had a cool name. As a lad, I remember yearning to use the Black Max, although I never found the courage to say, "Uncle Ed, could I borrow your Black Max?" Eventually, the racket become commonplace enough where getting my hands on one was simpler. Yeah, man, I loved that Black Max, but I'm wondering if it did more evil than good. The Black Max hit the market in 1980, the same exact time tennis style peaked. 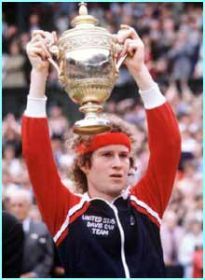 Take a look at any picture of Bjorn Borg or John McEnroe from that time. Yeah, man, those were two sophisticated gentlemen. After 1980 and the advent of graphite rackets, tennis style went way down. Ivan Lendl, for example, had decidedly less style than Borg, McEnroe and even the staid Jimmy Connors. Andre Agassi was simply a cheeseball, and nowadays, Roger Federer is about as exciting as a cornflake. Technically, the Black Max is an inanimate object and cannot talk. But I bet it would argue that its usage had nothing to do with the lack of style of post-1980 tennis champs. Some might say that style is alive and well in tennis today. I wholeheartedly disagree. If it didn't peak with Borg and McEnroe, then it peaked with Richie Tenenbaum.